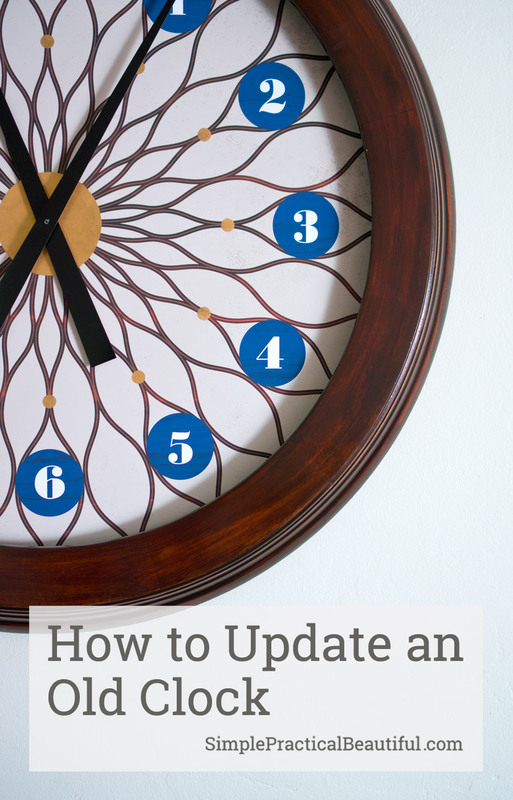 Update a large clock by replacing the face and refinishing the wood frame. 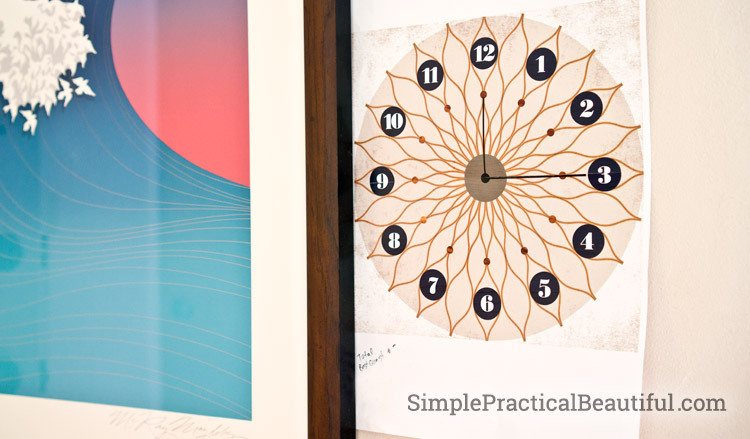 Make the style of the clock fit with the style of your home. I really like analog clocks. There’s no glaring lights like a digital clock. 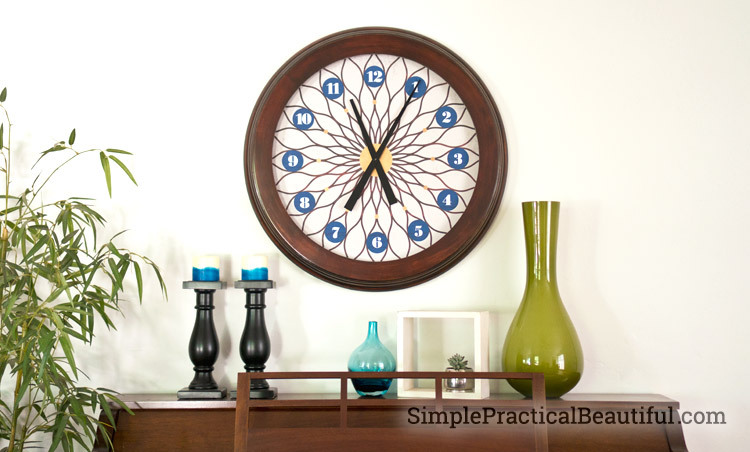 Most analog clocks add a nice circular design element to a room. 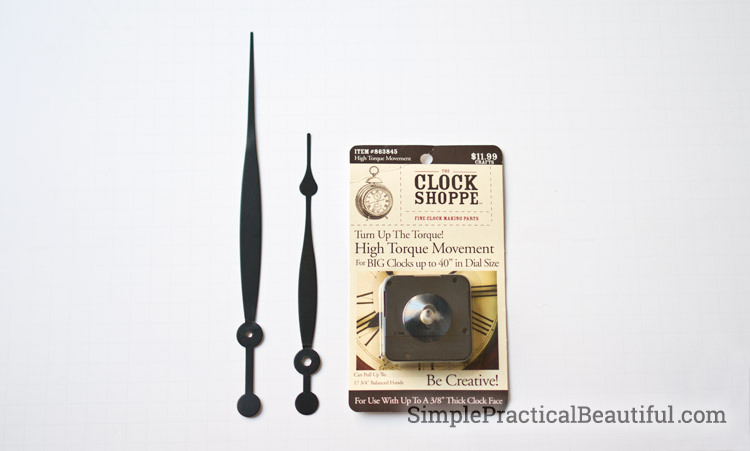 And the gears and mechanics of an analog clock just seem elegant. They are simple, practical, and beautiful. But first, I have to take a moment and explain a little about how I decorate a room. 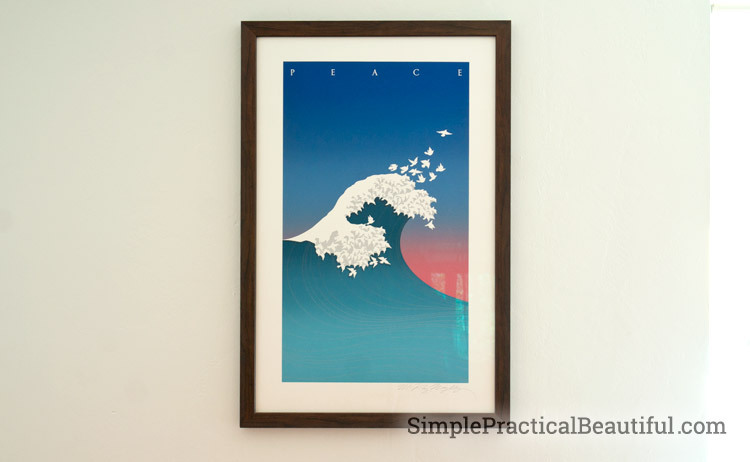 The easiest and most effective way I’ve found to make a room look cohesive and well-designed is to start with a large piece of art. In our front room, it’s this print. Then everything I buy, make, refinish, or create for that room has to work with that picture. It does NOT mean that I will only use blue, pink, and white in this room. It does mean that everything in the room will look good next to that picture. Usually that means that each object has at least a little blue, pink, white, or brown (the frame). Back to the clock. 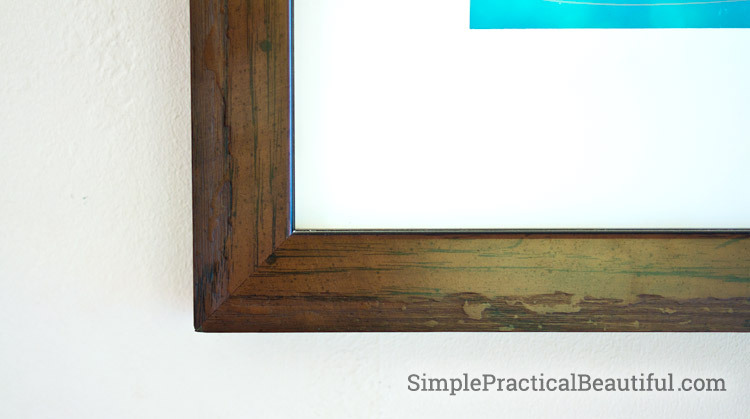 To make the clock fit with the style of the room, I wanted to refinish frame to look similar to the frame of the print. I liked the dark wood color with black wood grain showing. First, I sanded most of the black paint off my clock frame. I left some black in the crevices to add that touch of black and give the frame more dimension. Plus, it was easier. I started with an oil-based Min-wax red mahogany stain applied with a cotton rag. It’s one of my favorite stains. But because I had not used stripper to remove all of the old finish, the stain absorbed into the wood very unevenly. I tried alternating between sanding with steel wool and applying more stain. It was slowly building up color, but not enough and it still looked uneven. If I’d been more patient and continued, I probably could have gotten a better finish. I moved on to gel stain. 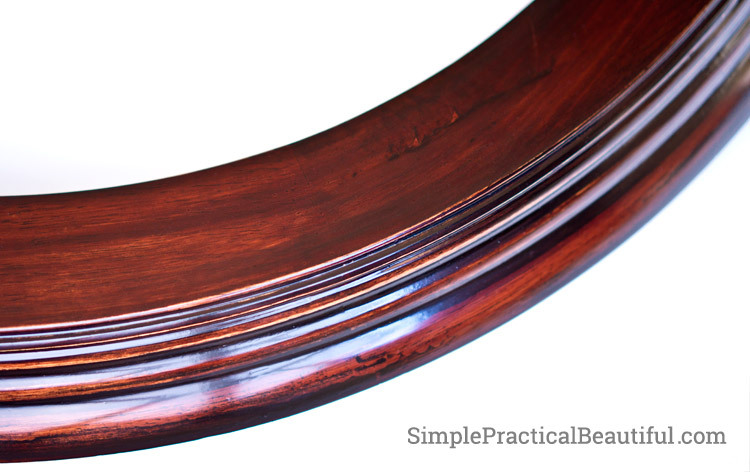 I applied a couple of coats of brown mahogany gel stain and it created a beautiful finish with plenty of wood grain and black accents showing through. Perfect. 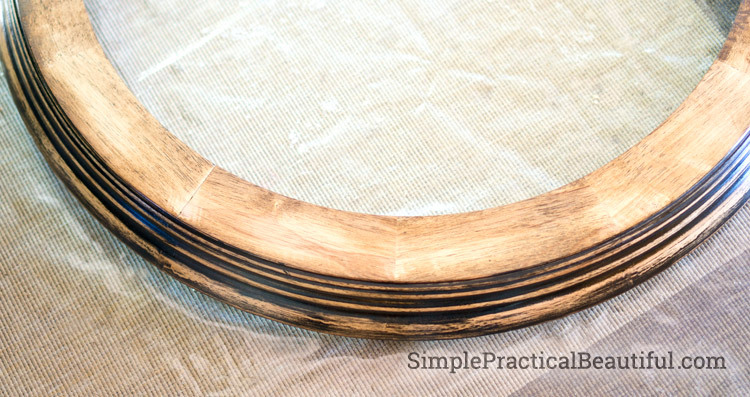 I finished the frame with a couple of coats of polycrylic, sanding a little between each coat. Later I learned that polycrylic does not work well will red mahogany stain, so it was a good thing that I switched to a gel stain. I also have to tell you that I waited days, sometime weeks between coats of the stains and the finish. I tend to take a long time working on wood projects, mostly because, well, life happens. Also because you don’t want to rush finishing. 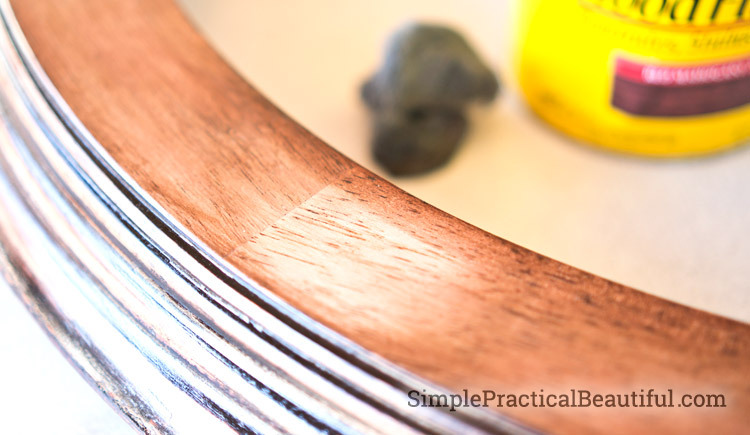 You end up with a mess if you try to work with stain or polycrylic that still sticky. I’m so lucky that my husband is not just a wonderful man and DIYer, he’s also an incredibly talented graphic designer. He created the clock face. I will try to describe what he did, but a good designer has a way of pulling a piece all together that I have yet to learn. 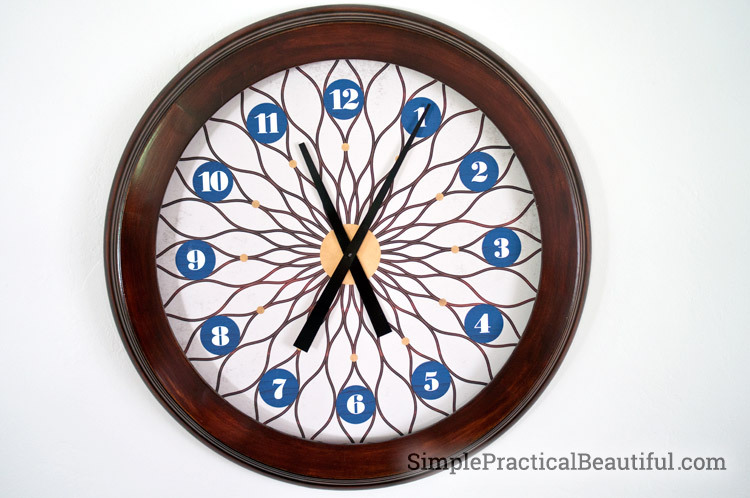 To create the new clock face, my husband first found a clock font. That means it’s just numbers, no letters. So the numbers are well-designed and not just an afterthought. 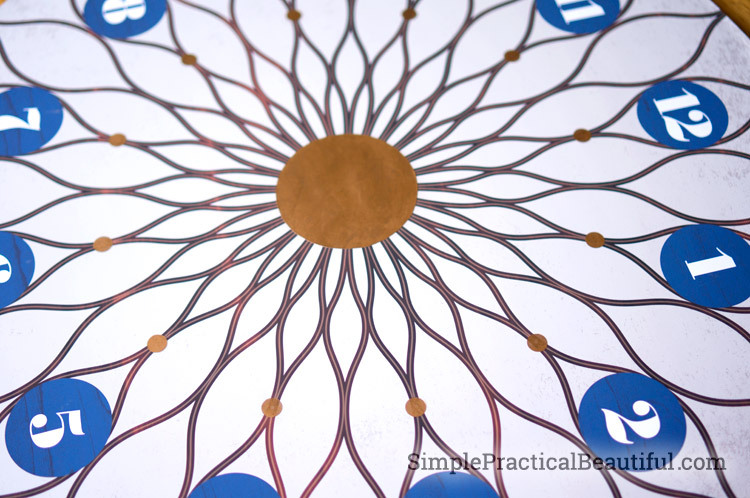 Next, he used the George Nelson clock (very mid-century modern) and recreated the shape and pattern in Illustrator. He added the numbers to the pattern inside circles. And then layered all sorts of textures, patterns, and grains behind the design it to give the image depth and interest. 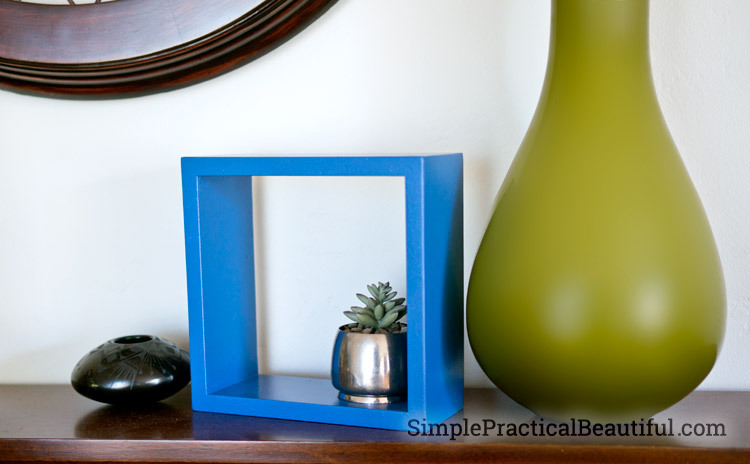 Solid blocks of plain color often look flat and homemade. The texture of the pattern makes it look real. We printed a small version of the new clock face design on our printer and hung it on the wall next to the print to try it out. We ended up making a few minor changes. Then we printed it out full size by printing it on four different papers and taping those pages together. This is when we realized it needed something that couldn’t be printed. Something metallic. 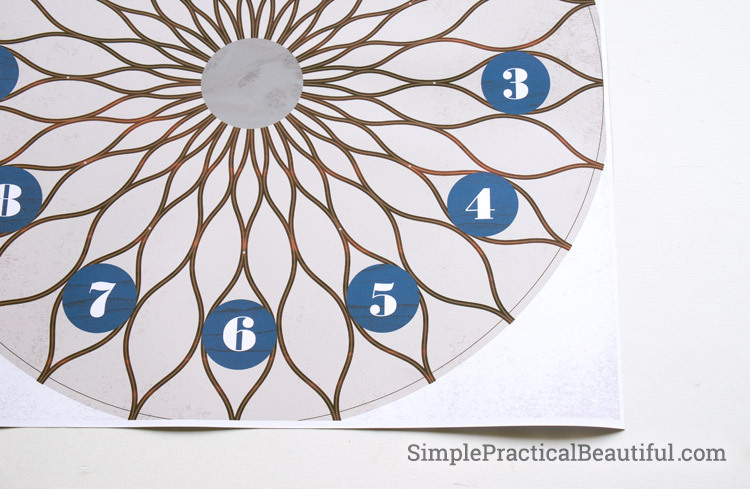 We looked at a lot of ways to cut out and apply metallic discs. In the end we just used contact paper painted with antique gold Rub n’ Buff (the same stuff we’ve used to refinish curtain hardware, make steam-punk costume accessories, and paint shelf brackets). It added a wonderful metallic finish and was easier than trying to cut metal. Rub n’ Buff looks a lot more like real metal than spray paint. We took the digital file to a printer to produce, because the clock face is larger than anything we could print on our home printer. The printer could also put the image on a heavy cardstock paper. You might notice that the color is a little different. Every printer will print colors slightly different. Luckily, we were really happy with these final colors. 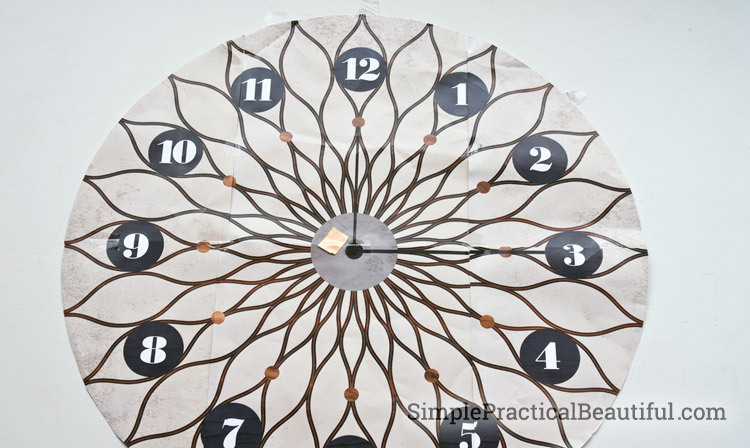 Here’s the finished clock face with metallic accents. It’s spray mounted on the particle board back of the clock. At this point we thought we could quickly put the clock together and hang it. Unfortunately, the old clock hands would not come off. We tried unscrewing and twisting pulling. We had to break into the mechanism on the back and pry off all of the parts attached to the hands. We saved the old hands because they were still in good shape and we thought they could be reused, and we bought a new clock movement. The old hands didn’t fit on the new movement, so we ended up buying new hands that looked better with the modern style of the clock. This large clock with a solid wood frame and particle board back is heavy. We hung it with a wall anchor made to hold up to 100 pounds. 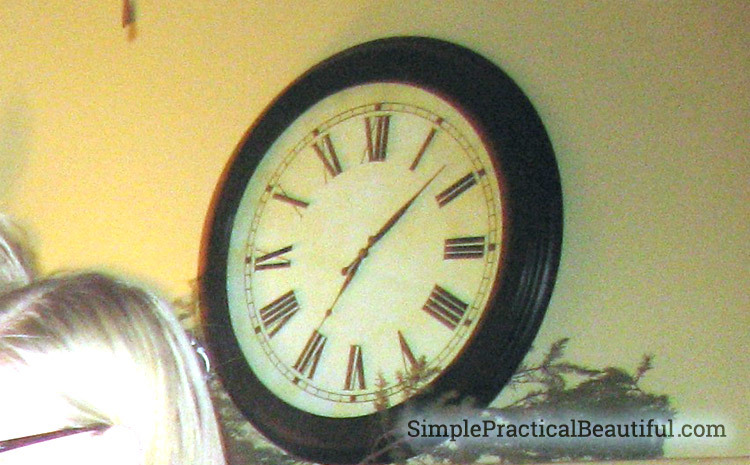 A nice bonus to refinishing your own clock is that you can match your decor to the clock. Here’s some things that I pulled together to decorate the space above the piano. 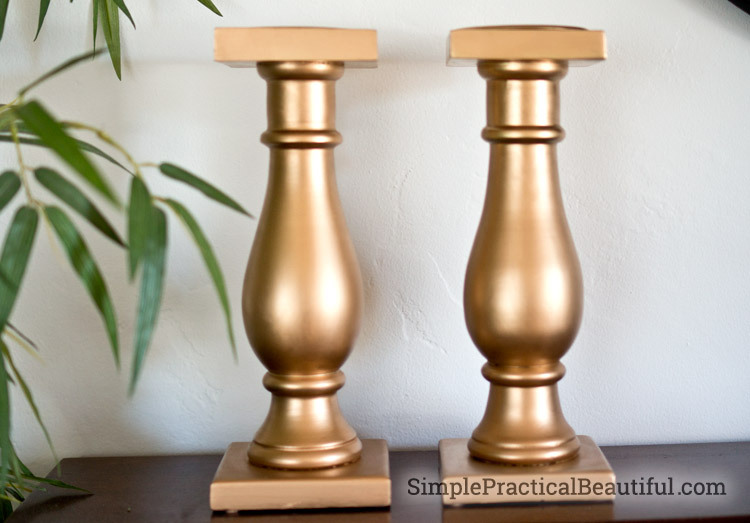 I painted the candlesticks the same gold Rub n Buff I used on the clock. This made them look better with the clock, and it also made them look less traditional. Their shape is pretty traditional, but being solid metal is very modern. The square added a nice geometric shape, but blended into the wall in white. I printed out a circle of the blue from the clock, then had Home Depot color match it and make a sample container of paint. The sample container was plenty of paint to cover the square. 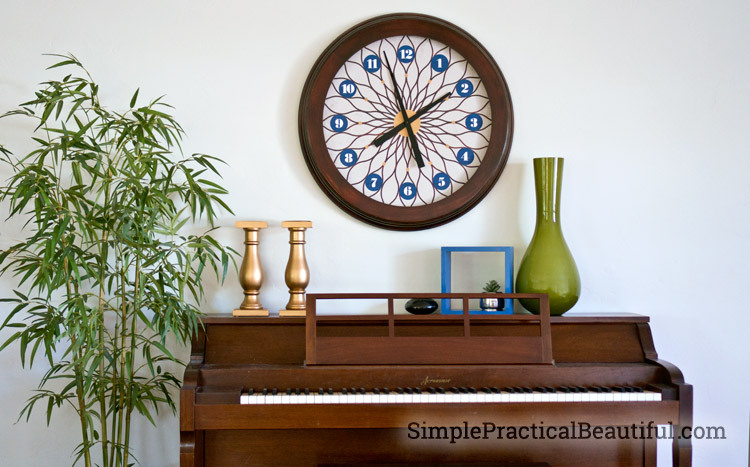 Here’s the finished clock above the piano. That side of the room is mostly decorated. I’d like the silk bamboo to be a little higher, and I need to find some modern-looking candles for the candlesticks. We also need to finish replacing the wood paneling on the other side of the room with drywall. Soon! Meanwhile, I love our refinished clock. 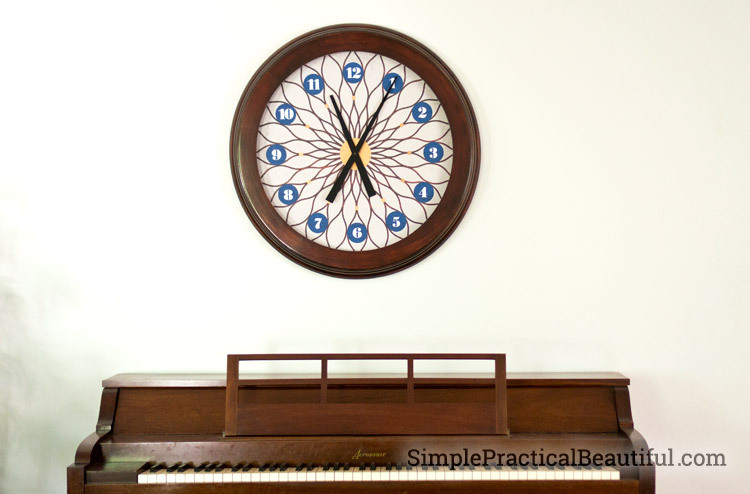 Now it should be easier for my daughters to keep track of their piano practice time! This turned out fantastic – Wayne sure is good at graphic design. 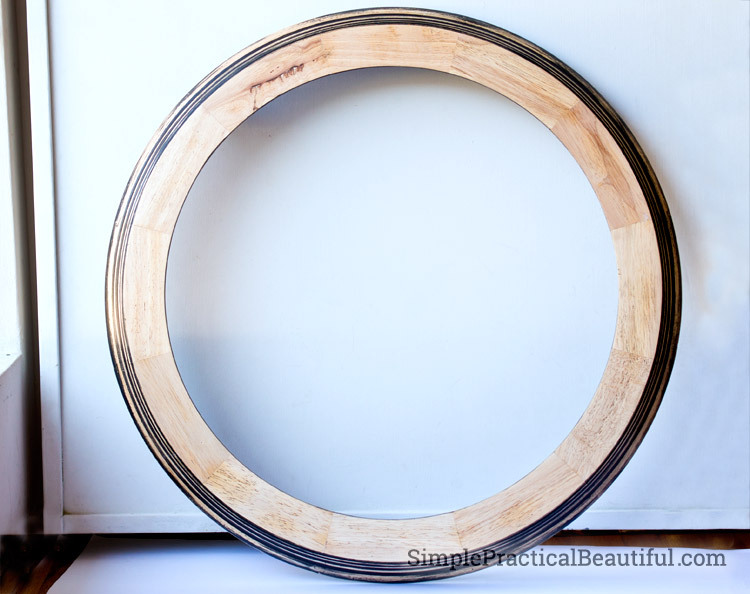 This repurpose is better than the original! He is pretty amazing, huh. He actually gave me the clock a few years ago as a present with a promise to redo the face of the clock. I’m glad we finally got it done. I love it! A great update, this clock looks really interesting and unique now! Thank you for sharing at our Sweet Inspiration party this week! Thank you, Katrin. It’s one of a kind! And thank you for hosting a fun link party. Love the revamp. It looks beautiful. Thank you very much, Kelley.